Hi Everyone! I’m pretty much all packed and I’m moving most of my stuff to San Jose this weekend. I finished two outfits but I probably won’t have time to do a shoot before I leave Fresno. I wanted to do a quick picture tutorial of how to sew sev plooj before I move. This is highly requested and I know people are going to request a video as well, but honestly recording is too much of a hassle for me to do myself and I don’t enjoy editing videos at all. So if you are waiting for a video it won’t happen because I tried and failed. I usually don’t finish that project and loose the drive to. Once grad school starts there will be less tutorials as I will be busy with school, work, and eventually committing to working out again. Last year, I made numerous outfits and that was one of my biggest excuses for not working out. There a different types of sev or aprons. The type that I am showing today is sev plooj. Typically, White Hmong in Luang Prabang, Sayaboury, and Luang Namtha wear this type of apron. Traditionally the middle or plawv sev is a different color than the outside. Sometimes embroidery or paj ntaub is used in the middle was well. I try to make each section about the same size, but I usually prefer for the middle to much skinnier especially if I’m making a full length sev. If I know I’m just planning on wearing it with a skirt I tend to make my sev quite short anywhere from 18-22 inches long. 1. For the lining pick a stiff fabric that creases well but don’t feel limited to doing so. I crease the edges of the lining before I sew the outside fabric onto it. I fold and sew by hand, but you can turn good side to good side and sew and flip if you choose not to sew by hand. I personally never tried it but in in theory it should work. I try to have it be 9-10 inches wide and 20+ inches long. The length is up to your preference. Traditional sev are about 1 yard long. 2. Cut out the fabric that you will use for the outside. It should be about 4.25 inches wide and about 2 yards long depending on length (traditional you’ll need at least 2.25 yards). 3. Fold one edge as you sew it onto the lining. You can iron it all the way down too. 4. I usually leave excess to fold in at the top later. I start on the left side of the lining and work my way around using small stitches. For the top and middle section, cut a piece of fabric off the end. Center and sew 5. Now fold the bottom corners of the sev. I try to make a 45 degree angle. 6. Cut excess fabric from under the corner. This gets rid of the bulk. 13. Take out the baste stitches and attach fabric to tie it around the waist. Hopefully the pictures of the two different sev aren’t too confusing. I wanted to show with a plain middle and one with the paj ntaub. This is how I was taught to sew it and isn’t the only way. Apparently it’s prettier the flatter and thinner it is. I usually just iron it at the end and then fold it up for storage. If you are beginner use fabric with little stretch and that creases well. I prefer cotton. In my last post, I mentioned that I had prepared too many outfits this year for Fresno Hmong New Year. I had to narrow it down to the outfits that took me longest, had sentimental value, and had prior reservations. Now that Hmong New Year is over, and its the start of 2019 I can put my clothes away and start packing. I won’t be able to do as many Hmong Outfit Series posts as I’m starting grad school and moving to San Jose. However, I’ll try to fit in as many as I can throughout the year. I might be busy with grad school, but I know I won’t stop collecting outfits. Honestly, I’m a little sad that I won’t be able to sew as often but I know that I already have plenty of outfits for Hmong New Year. I made my cousins and I matching outfits this year. We went with the White Hmong Xieng Khouang style. I wanted something simple but I made a mistake with my fabric choice. Next time if I’m short on time and making lots of outfits I’m sticking to cotton. Plain and simple. I actually burned one of the shirts while ironing so that set me back. It’s still rewarding when I look at our pictures together. It’s not my best work but it looks good from far away. This year my cousin’s boyfriend dressed up with us as well! I opted to wear my blue hat with my Hmong Leng Sayaboury outfit because my grandma made me this little coin belt years ago. Last year I added coins and since the beads were blue, I paired it with my blue hat. My grandma stopped making paj ntaub mos when I was really young so there aren’t a lot of examples of her work. I think she started me at 3 because I was supposed to practice reverse appliqué and eventually make my own. I can do regular appliqué it’s just not that best. Another reason, I chose this outfit is because my mom is from this province in Laos. She wears the White Hmong Sayaboury outfit with pants. This outfit is the outfit that started my sequin adventure. I want a Striped Hmong Outfit but wanted something different and something that I didn’t see before so I opted for paj ntaub cog ci version. Originally I wasn’t going to make the hat but it was hard to stop. At that point I wanted sequin versions of everything. Posing with one of my favorite Hmong dance groups Tseem Tub Ntxhais Hmoob. They won 1st place in the dance competition this year! Sequin hat to match my blue sequin outfit. If it’s not already apparent, blue is also my favorite color. I kinda regret not serging this fabric and using french seams as some parts of the gold is fraying and coming out. Every project is learning experience and I’m constantly learning that I’m a little lazy with too many ideas. I had the chance to meet Neng Now! Can’t wait to see his video. The last of my sequin projects was my sequin princess hat. I wanted this hat to shine so I opted a simple and modern look. I love the poofy skirt and helped me feel like a princess. There were different white pleated maxi skirts that other vendors were selling but I didn’t want to wear one with a hoop under as I wanted it to flow and move naturally as I walked. Also, some weren’t puffy and just sadly hang. I woke up on the 6th day with puffy eyes probably because I’ve been outside consistently without taking my allergy medicine. My cousins and I had agreed on wearing Thai outfits on this day months ago and we picked on of the coldest days. My outfit barely fit me as I gained a bit of weight since I bought mine 2-3 years ago. The last day of Fresno Hmong New Year was the day that I struggled to pick an outfit. For a while I was debating between 3 options but I decided on wearing this vintage Hmong Chinese outfit that I bought a couple of months ago. I always wanted one when I was younger but my mother refused to buy me one because she didn’t like it. When I was old enough to buy myself one they no longer made these outfits. I also promised myself that I wouldn’t alter the outfit maybe just the skirt. However I think I changed everything but the hat and leg wraps/nrhoob. I shortened the tails of the sash in the back, took in the sleeves, and shortened the sev. Now it’s a lot more flattering on me and I’ll actually wear it instead of just hoarding it in my closet. Thank you for reading! 2018 was a fun year filled with traveling and crafting. I’m excited to start grad school and like everyone else my New Year’s resolutions is weightless/fitness related. Just need to get back on track so I’m stronger, fitter, and healthier. Sewing makes me quite sedentary and I’m not taking a sewing machine with me so there will be a pause on my projects. Hi Everyone! I know I promised a mens shirt drafting tutorial but I might have to push until after Hmong New Year. Today I’m showcasing a little picture tutorial on a hat that I made. In a previous post I made a version that omitted the top flap so that I could have a huge bun top. This headwrap has various names from Phuam Hmoob Haum Vaj Sab, Phuam Hmoob Lauj, and Phuam Ntswg. Phuam Hmoob Haum Vaj Sab is worn with a sev plooj outfit and also originated from the Lao province Luang Prabang. This headwrap however is different than the type that my family typically wears as show in this post. We wear phuam dai hlaws or (phuam dai paj which I didn’t grow up hearing as often). I drew a little pattern on paper to trace out the shape on the foam. I think I made the highest peak a little high on mine. The pattern above is folded in half and based off my measurements. I left excess on the ends about 3 inches on each side. You’ll need two pieces of embroidery. I used a pattern that would match my outfit. Cut out black fabric that will be wrapped about the hat and for the flap. For the wrap portion, the length is about 60 inches and width is about 5 inches. The flap should be about 15 inches long and 9 inches wide. Sew embroidery onto black fabric and hand sew the back. Next, sew the black jersey fabric around the foam. I used a really thin foam about 1/4 of an inch. Then, overlap the two ends of the hat and sew. Position one end of the flap in the middle of the front of the hat and sew onto the jersey fabric. Wrap the other piece around the hat so that the embroidery is centered across the forehead. Hand sew it onto the hat. 10. Now you are ready to decorate the hat with pom poms and tassels! Thank you for reading! The pom poms that I used were a little larger but I was too lazy to make new smaller pom poms. The other day I realized that I had too many outfits prepared for Hmong New Year this year but it’s okay I’m almost ready for next year. I can’t wait to wear this hat with the outfit that I’m making. So stay tuned for that outfit post in the next couple of months. 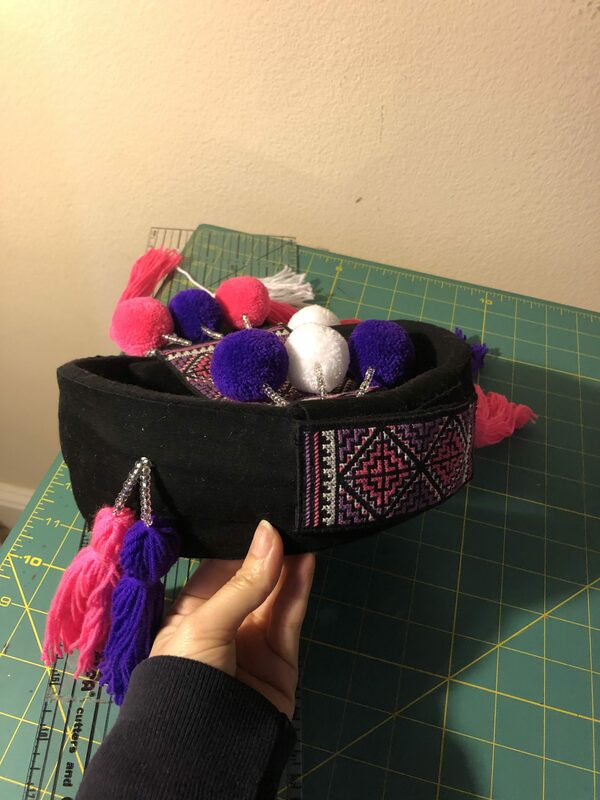 Next week do you want to see my outfit based off of the Hmong Leng Sam Neua or my princess hat? Let me know in the comments below! Hi Everyone! Paj ntaub cog ci is trending again and I’m ecstatic! This outfit took me so long to make! I finished just in time to wear it to Hmong New Year. Honestly, it’s worth buying over making since I spent so much time sewing on sequins. 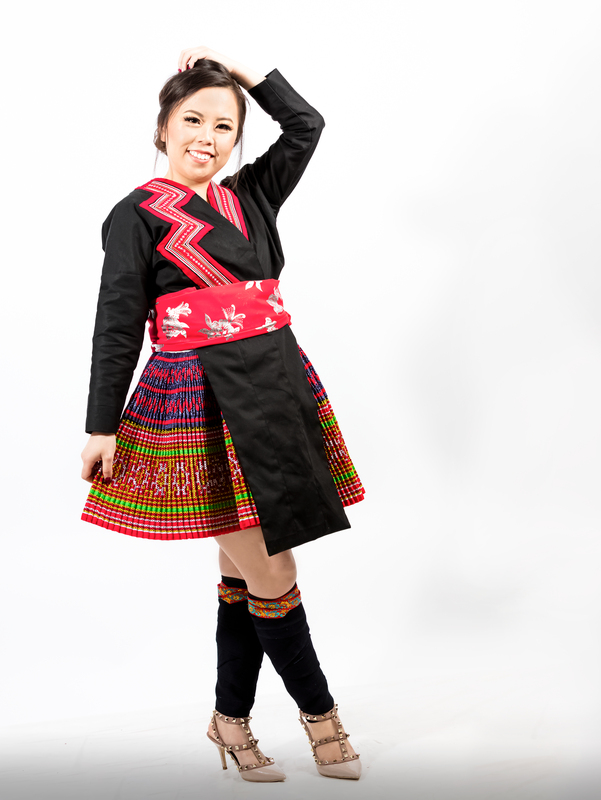 Unlike the other outfits in my Hmong Outfit Series, this outfit doesn’t belong to a specific region. Paj ntaub cog ci was popular in the late 80’s and 90’s and showcases a period of innovation, transition, and adaptation. My cousin’s outfit reminded me of the outfits that I wore when I was younger. 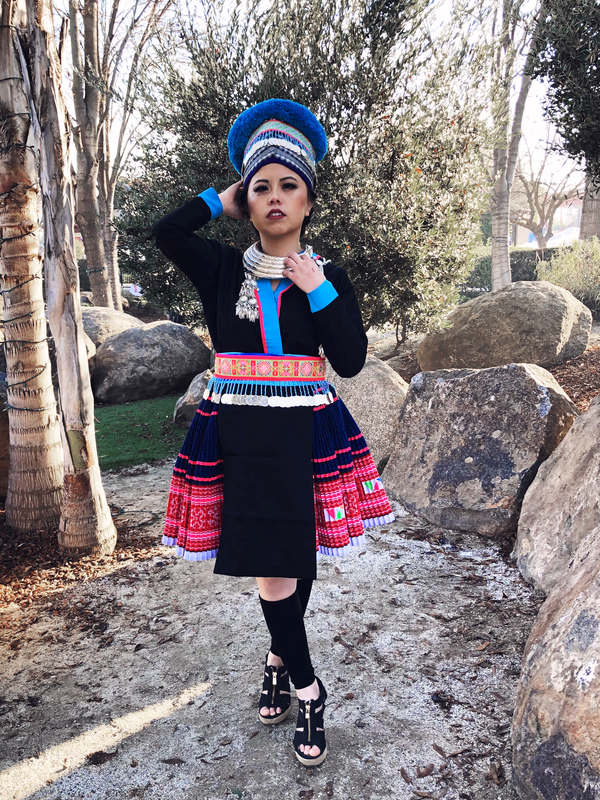 I had various Hmong outfits made out of the Thai skirt fabric material and I wanted to make an outfit that had elements of the past, incorporated my favorite colors, and that was more fitted. Paj ntaub cog ci consists of embroidery and sequins. There are different patterns – some with more embroidery than others. Sequins are applied in the empty spaces. Sometimes lace is added on top of the borders surrounding the embroidery. I chose to omit the lace to have the blue stand out. I also took out the little triangles for two main reasons – I’m lazy and I don’t like them poking me. The outfit looks clean, simple, and there’s more focus on the blue and sequins. I made my shirt the traditional style just not as loose. This was because I thought that the fitted style with princess seams would be more difficult. Since it would require me to align the diamonds at every seam and I had a limited amount of fabric to use.Then, I ran into another problem with the print of the fabric. I wanted the diamonds to run vertical and not horizontal because it give the illusion of being slimmer and if it ran horizontal I would look wider. So in the end I still had to align the diamonds. Usually with traditional shirts there isn’t a seam across the shoulders but if you look really closely on my shirt you can see the seam. I didn’t really care about the pattern matching super closely where I attached the sleeves though. Originally I wanted a 3/4 sleeve shirt but I made the mistake of cutting too much off of my sleeve embroidery. Do you see a trend here? This entire process was a cycle of failure and compromise with way more patience than I thought I possessed. So I had to settle for a long sleeve shirt. Additionally, I made the shirt a little to small for me. Despite the mistakes along the way, I’m super excited to wear this outfit to Hmong New Year. I’m pairing it with the hat that I featured in this post. Thank you for reading! I can’t wait to show the finished princess hat that I made to go with this outfit too. I’ll showcase it with a different outfit though. Something that is different than what I usually go for. I’m trying to stay away from sequins for a while squeezing in some last minute projects before the year is over because I won’t be able to sew for a while. Hi, Everyone! Are you excited for Hmong New Year??? As I finish more and more projects, I’m getting restless. I have so many outfits and not enough days to wear them! I try to placate myself with telling myself that there is always next year. Today, I am featuring a type of Hmong Leng outfit specifically Hmoob Moos Pheeb as part of my Hmong Outfit Series. I made the shirt, apron, and hat for this outfit, the rest of the pieces I bought. Hmoob Moos Pheeb live in Central Laos. Moos Pheeb or Muang Pheng is a city that is located in modern day Xaisomboun province. In the past, Muang Pheng was in Xieng Khouang Province close to the the border of the Vientiane province. There are two main types of headwraps that they wear-a black wrap or one with multiple siv ceeb. Nowadays, the siv ceeb type is made into a ready to wear hat. Sometimes triangle shaped pieces of embroidery are attached to the back of the hat. I attempted to make my own hat for this outfit and I think I used about 13 layers of siv ceeb. I’ll admit it took me a couple of attempts to make it and it’s definitely worth buying. I just like trying to figure out how to make it. The shirt is similar to that of the Hmong Leng of Sayaboury with the dab tsho sewn face down. I opted to sew mine facing up because I wanted a some variation in my collection. Hmong Moos Pheeb tend to wear their shirt so that the rows of appliqué shows. However, the sleeve length and width vary. I’ve seen longer tapered sleeves with a small cuff or wide short sleeves with a larger cuff. The cuff tends to be a dark blue. In the past Hmong outfit series posts, the outfits I featured wear paired with a different type of xauv. Xauv that varied from 1 to 5 rings. My favorite xauv are the original 2-3 layer xauv from the Luang Prabang and and Sayaboury region of Laos. Tapered, round, and hollow – the torques are beautiful. Hmoob Moos Pheeb pair their outfits with xauv ncais. This type of silver necklace can be simple or more elaborate decorated with different links and ornaments. The xauv ncais that I am wearing in the photo is an old traditional xauv. This xauv has a higher percentage of silver than the xauv that are currently being sold today. Presently, xauv are made of brass and silver and this is commonly referred to as “silver 2.” One benefit is that they are lighter and easier to wear. This group of Hmong is sometimes referred to as “hmoob hnav tiab liab/ moob naav tab laab” (Hmong that wear red skirts). Hmoob Moos Pheeb wear a skirt with rows of red or pink appliqué on the middle of the skirt in between spaces in the batik design. Criss cross appliqué adorn the top of the middle section of the skirt followed by alternating straight lines and zig zags. The bottom of the skirt or taw tiab/ taab tab consists of cross stitch embroidery – usually orange, pink, and white thread and some appliqué. Typically, green lines are appliqued along the taab tab. Additionally, the very bottom of the skirt is white and lacks appliqué. I love collecting and investing in Hmong skirts. A single skirt consists of 5-6 yards of fabric! Just imagine the amount of time it takes to make one skirt. Honestly, if I spend my time making one I would never sell it. Traditionally, this outfit pairs with leg wraps/ nrhoob. Unfortunately, my nrhoob didn’t arrive on time for my shoot. Thank you for reading! A lot of you have been waiting to see my finished paj ntaub cog ci outfit. I plan on sharing that outfit next and followed by my sequin princess hat or tutorial. While finishing up my outfits, I’ve been trying to make a men’s shirt. Once I have my pattern down I’ll share a picture tutorial with you all. Most likely, I’ll make myself a men’s shirt. Crop tops are in right? Let me know in the comments if you would be interested in learning how to make a men’s shirt. *Outfit details pertains to my outfit, and the links provided are from sellers that I personally purchased from. Hi, Everyone! I can’t believe Hmong New Year celebrations have already started in California! I can’t wait to dress up and browse the stalls. Usually, I spend most of my time shopping. 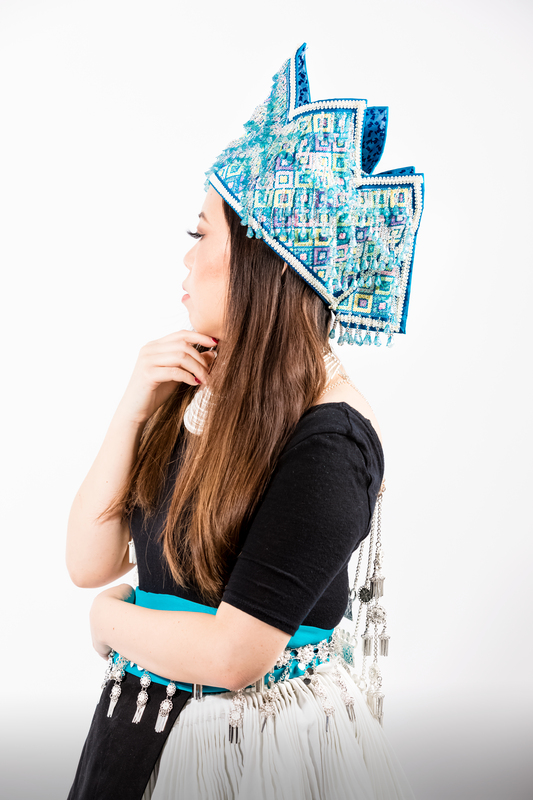 Today, I am featuring Hmong Leng Sayaboury as part of my Hmong Outfit Series. Previously, I featured the White Hmong of Sayaboury. Hmong Leng and White Hmong of Sayaboury share some similarities in the way they dress such as their head wrap and xauv. They wear xauv that consists of separate rings. Pictured is a modern five layer xauv. Hmong Leng Sayaboury wear a black shirt with short blue cuff on their tapered long sleeves. The cuff is usually about an inch. Appliqué runs down the front of the shirt opening, but it is usually folded over so that only the lining and needlework shows. The dab tsho is also sewn face down on the back of the shirt. I’ll admit that this shirt was a little difficult for me at first to wrap my head around as I’m so used to making White Hmong shirts. The dab tsho is attached differently. Also, I was a little confused about attaching the handmade appliqué pieces that I bought for the front of the shirt. Usually, the lining of the shirt is blue and the appliqué is done directly on the shirt fabric. However, I’m not that great at appliqué and it’s quite tedious. I ended up piecing it together my way. At least it looks traditional. They wear a black sev that consists of three sections and a pink or red sash that is either separate or directly attached to the sev. Like other Hmong Leng groups in Laos, they wear leg wraps or nrhoob. White Hmong don’t wear leg wraps anymore as they transitioned to pants. Deceased White Hmong women are still dressed in leg wraps with their white skirt. The leg wraps are wrapped inwards for the living, and wrapped outwards for the dead. I didn’t grow up wearing leg wraps, occasionally I would opt for leg warmers because I tend to forget the right way to wrap. Hmong Leng speak a different dialect than White Hmong, and it usually throws me off, even the written language is slightly different. 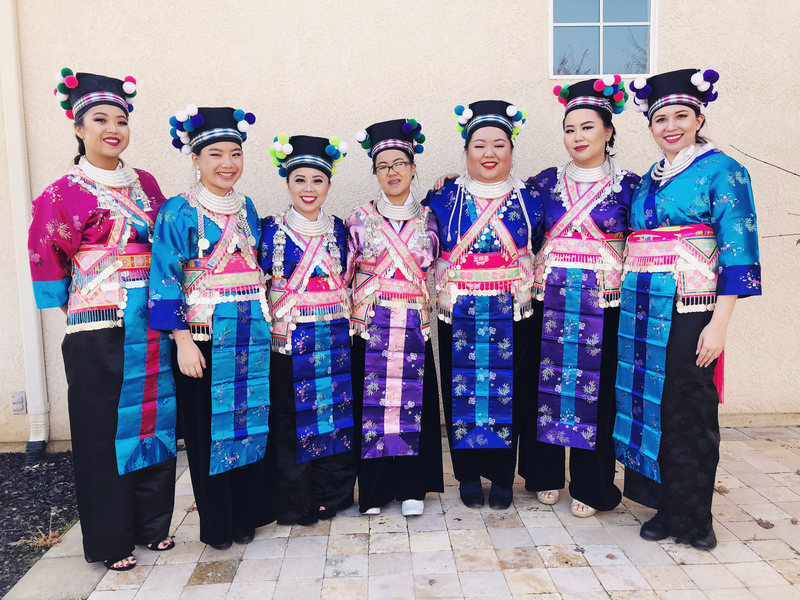 This group of Hmong are typically referred to as “hmoob hnav tiab dub/ moob naav tab dlub” (Hmong that wear black skirts) or shortened to “hmoob dub/moob dlub (Black Hmong). However this term “hmoob dub” isn’t exclusive to this group and is slightly misleading. It mostly refers to skirt which isn’t really black but a dark indigo from the dye. The indigo dye can permanently stain fingers and hands. 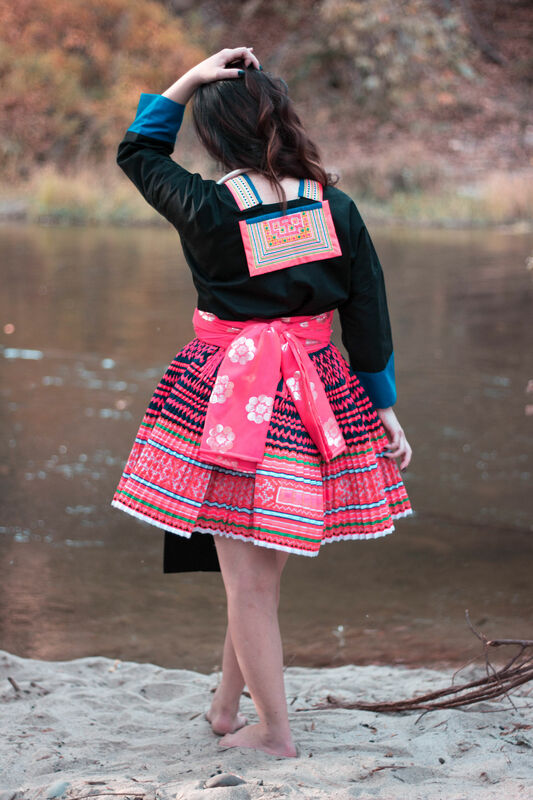 Unlike other groups of Hmong Leng in Laos, the Hmong Leng of Sayaboury still keep the middle of the skirt or ntu tiab /nthus tab free of ribbons and appliqué. This allows them to show off their exquisite batik skills. The bottom of the skirt or taw tiab / taab tab consists of cross stitch embroidery – usually orange, red, pink, and white thread is used and some pink appliqué runs along the width of the skirt. Lastly, the very bottom of the skirt is white without any appliqué on top. Thank you for reading! I can’t wait to wear this outfit for Hmong New Year. I’m probably going to switch out the hat with the blue one that I made for a past tutorial and pair it with a blue sash since my favorite color happens to be blue. Still debating on whether or not to wear leg wraps to New Year. Don’t forget to follow and share the blogpost! I would like to thank Nancy for taking the time to take photos for this blog post and for a future upcoming blog post. Not only that, thank you Ka Vang for modeling for this series as well. Happy Thursday, everyone! 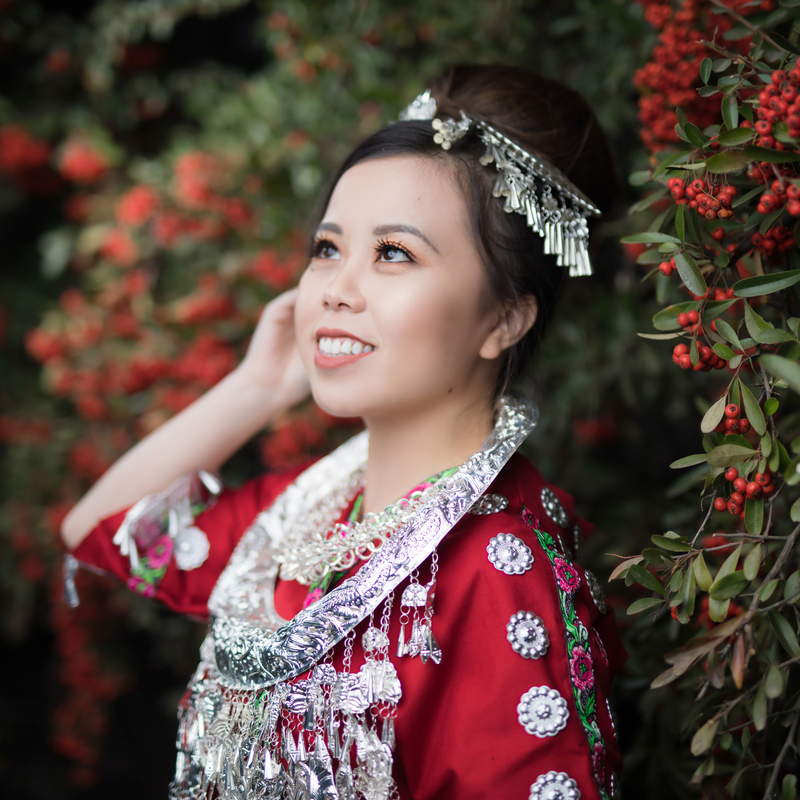 Today I’m sharing a Miao outfit that I made last year. Originally I was going to wait until I finished a tutorial for the shirt, apron, and sash before posting the outfit, but I decided that if I waited it would probably take another year. Honestly, it’s not high on my priority list since I have a lot of Hmong outfits left to make. I still have to finish some outfits for Hmong New Year! In the summer of 2017, I visited one of my best friends in China and explored parts of Yunnan and Guizhou province with her. I was inspired to make this outfit based off of some of the outfits that I saw. In the past posts, I featured Hmong outfits and this post doesn’t quite fall into that category. In China, the Miao are the 5th largest minority group and Hmong is one of the subgroups under Miao. The other three subgroups include the Hmu, Who Xiong, and Ah Mao. I remember walking through the streets of the Xijiang Miao Village and my friend asked me if I understood what the local people were saying. No I don’t. They speak a different branch of the Miao language and most of the words I didn’t understand. The heavily commercialized 10,000 Miao Village featured the Hmu sub group of Miao. They wear a lot of silver accessories and some are sewn onto their clothes. Silver is a sign of wealth. Some wear long skirts and others wear short skirts. I managed to bargain with one lady for a traditional long skirt outfit and accessories so I decided to make a short skirt version. The shirt is wrapped and tied on the side with the front of the shirt longer than the back. For Sacramento Hmong New Year I actually paired this outfit with a black skirt but I forgot to bring the black skirt to my photoshoot with Houa. The day of the shoot, I was rear ended so my mind was a little scattered. In Datang, they wear dark blue pleated mini skirts! The skirts were super short but most wore shorts under and their leg wraps go much higher than what I’m used to seeing. Another outfit on my never ending list to replicate or acquire. Thank you for reading! 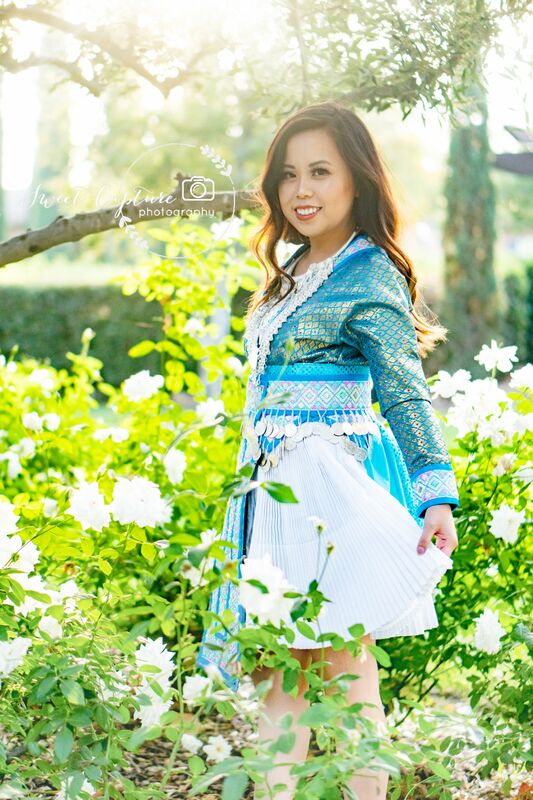 I have a couple of shoots planned so stay tuned for more Hmong Outfit Series posts. I can wait to share some of my finished projects for Hmong New Year as well. Happy, Thursday everyone!! In this photo, I am wearing a Flower Hmong outfit from the Lao Cai province in Vietnam. After seeing pictures of this outfit from markets in Bac Ha, I fell in love.The long circle skirt consists of batik replica fabric, cross-stitch embroidery, and rows of appliqué. I felt like a princess covered in a kaleidoscope of colors prancing around in the forest. Traditionally Flower Hmong wear a colorful headscarf, but I couldn’t find one I liked so I opted to DIY some hair accessories to add a little silver to the outfit since they wear very minimal accessories. The shirt has rows of machine applique along the arms and around the yoke of the skirt. Usually frog clasp or zippers close the front of the shirt. This Flower Hmong shirt pattern is different from the previous outfits that I featured as part of my Hmong Outfit Series. It’s similar to the Hmong Chinese shirts with standing mandarin collar. Sometimes the bottom of the yoke is decorated with ribbon, decorative trims, and beads. This type of shirt lacks a dab tsho. Flower Hmong wear long skirts that usually end mid-calf or ankle. The top of the skirt consists of batik print fabric to mimic batik. The middle consists of cross-stitch embroidery with orange, yellow, and white thread and colorful rows of applique. Each row is thin about 2 mm. The very bottom of the skirt is a more velveting material in a contrasting color. 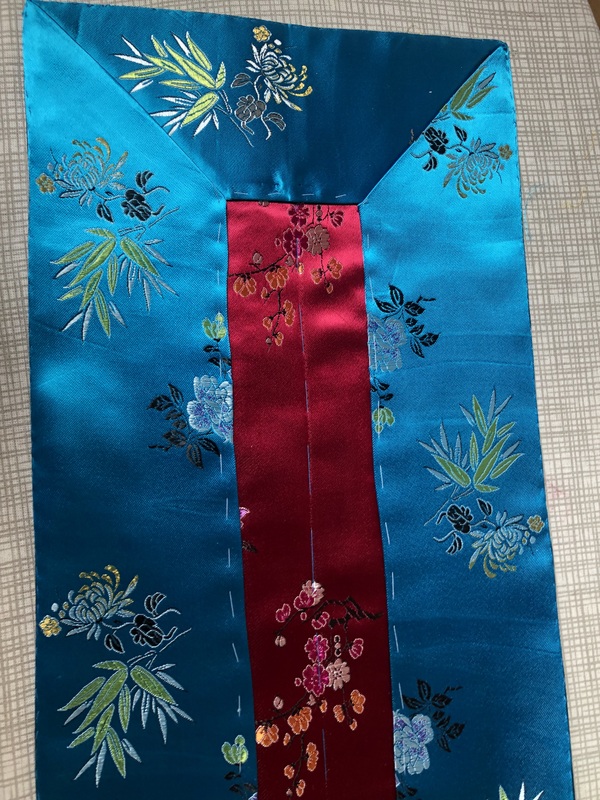 I’ve seen the Flower Hmong wear either two short aprons with one in the front and back or one longer apron in the front. Presently they wear colorful headscarf, but in the past they wore a headwrap. 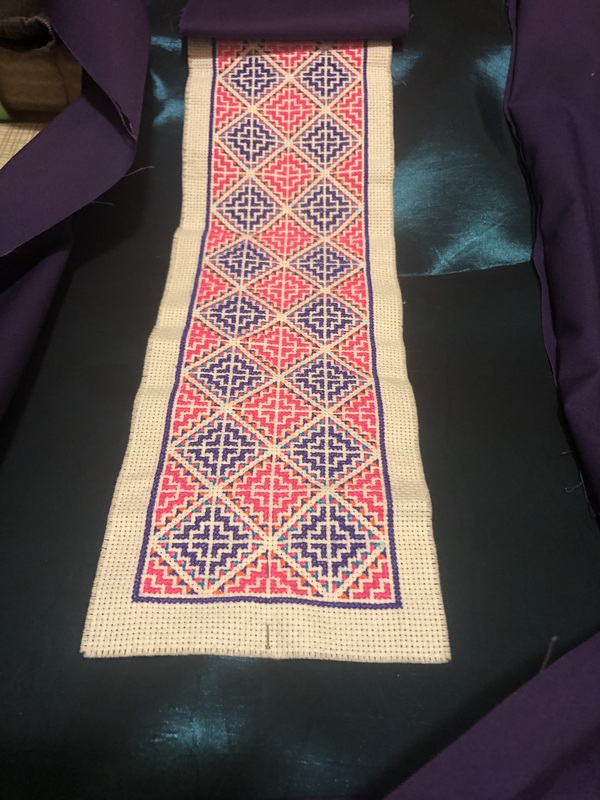 As Hmong New Year is approaching, I’m constantly rearranging my Hmong clothes and hastily finishing projects. I’m spoiled in the sense that I dislike rewearing the same exact outfit from the year before. I don’t mind wearing the same style just not the same exact outfit. 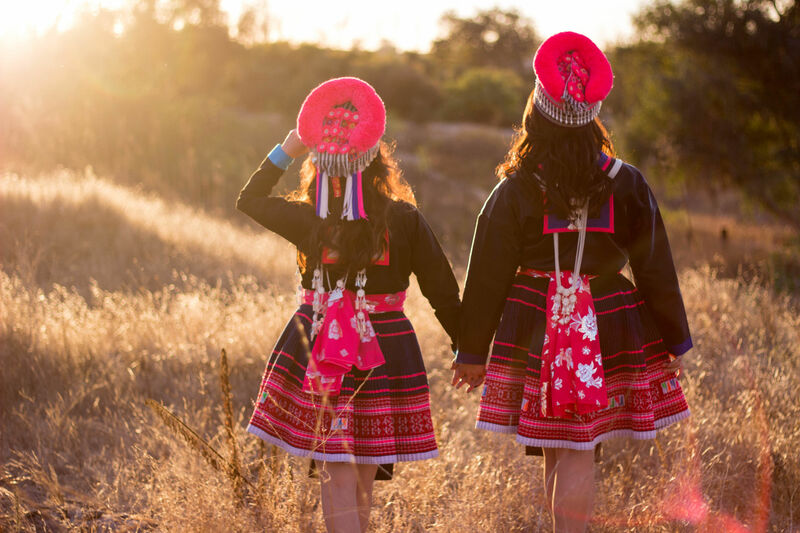 What are you planning on wearing to Hmong New Year? Thank you for reading! I hit 300 likes on Facebook and currently holding a little xauv giveaway. The winner will receive a male xauv! To enter, like my page, share my post on Facebook, comment what you are planning on wearing to Hmong New Year, and tag 3 friends. The giveaway will close in a week on Friday, October 12th.